I am eternally searching for new twists on vinaigrette. It’s one of the easiest kitchen projects to take on, and great for letting kids experiment with different herbs, vinegars, oils, members of the onion family, etc. Once you start making your own dressings, you realize that not only is it super simple, it is also full of endless combinations that might not be found on the store shelf. This one stars scallions, which has a wonderfully mild onion flavor. It also uses brown mustard, which is coarser and has a more robust flavor than regular mustard. It would be good on all kinds of lettuce and vegetable combinations; always feel free mix and match whatever kinds you or your kids like, or venture out and try a new one. Mixing lightly cooked vegetables --- such as steamed or roasted broccoli, cauliflower, or asparagus -- makes a salad more substantial, while still keeping it vegetarian. You could also toss in some beans (pinto, black, or chickpeas would be perfect) to make it even more filling and hearty. 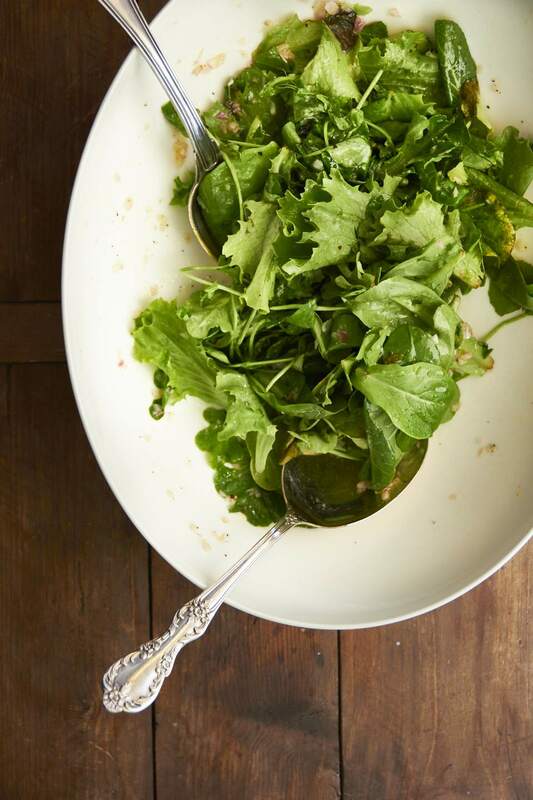 In a large bowl toss together the mesclun and romaine. In a small container or bowl, combine the olive oil, red wine vinegar, white wine vinegar, scallions, mustard, salt and pepper. Stir or shake to blend well. Drizzle the dressing over the greens to toss to coat well.